We sell a wide assortment of lubricant sprays such as the silicone lubricant spray, penetrating lubricant spray, Teflon lubricant spray, etc that comes to be utilized across many industrial backgrounds and come composed using high quality raw inputs. We sell our output at industry leading prices and offer excellent post sales services. We sell at very reasonable prices. We import Dry Lubricant Spray from FAREN Chemical Industries, Italy. Spray Fill India Pvt. Ltd. is ISO 9001:2008 Certified Company. We are engaged in offering Dry Lubricant Spray that is manufactured with the high-quality raw material. These are available in different capacities. We offer this Dry Lubricant Spray as per the requirement of our valuable clients. We do special packaging of these Dry Lubricant Spray as to deliver safely at the client's end. it has a temperature resistance of - 180°C to +240°C. It can be used on sliding rails and guide systems, door hinges, and locks sliding doors, gear wheels and drive belts, tilting window, furniture hinges, drawers, ball bearings, electrical switches, cutting tools and threads. Can be used as separation agent. Used in car window for smooth working and to prevent glass & rubber noise. It is used as a permanent lubricant for shafts in plastic bearings and as waterproof coating for paper and cork seals and packing. Provides dry lubrication of oily and greasy sliding parts. We import Car Rubber Seal Protector Spray from FAREN Chemical Industries, Italy. Spray Fill India Pvt. Ltd. is ISO 9001:2008 Certified Company. We are engaged in offering Car Rubber Seal Protector Spray that is manufactured with the high-quality raw material. These are available in different capacities. We offer this Car Rubber Seal Protector Spray as per the requirement of our valuable clients. We do special packaging of these Car Rubber Seal Protector Spray as to deliver safely at the client's end. We import PTFE Lubricant Spray from FAREN Chemical Industries, Italy. Spray Fill India Pvt. Ltd. is ISO 9001:2008 Certified Company. We are engaged in offering PTFE Lubricant Spray that is manufactured with high quality raw material. These are available in different capacities. We offer this PTFE Lubricant Sprays as per the requirement of our valuable clients. We do special packaging of these PTFE Lubricant Sprays as to deliver safely at the clients end. it has temperature resistance of - 180°C to +240°C. It can be used on sliding rails and guide systems, door hinges and locks, sliding doors, gear wheels and drive belts, tilting window, furniture hinges, drawers, ball bearings, electrical switches, cutting tools and threads. Used in car window for smooth working and to preevent glass & ruuber noise. We are the eminent manufacturer and supplier of a wide range Silicone Lubricant Spray that is highly demanded in every commercial and noncommercial sector. These Silicone Lubricant Sprays are manufactured using a high grade of raw material that is procured from our reliable and trusted vendors. Owing to its anti-staining property, the molds produced require less cleaning. It contains a unique versatile grade of silicone fluid. We provide a wide assortment of Mould Lubricant Spray that is manufactured by using the qualitative raw material. These raw materials are procured from trusted industries. These Mould Lubricant Sprays are available in different specifications. We provide these Mould Lubricant Sprays as per the need of clients at competitive prices. Comprises Mould Release Silicone Spray &Mould Release Spray without Silicone. We are the leading manufacturer and trader of an eminent range of Mould Release Silicone Spray that is available in several specifications. We do quality checking of these Mould Release Silicone Sprays before supplying towards client’s end. These Mould Release Silicone Sprays are used for the commercial and industrial purpose. We provide a wide assortment of Non-Silicone Mould Release Spray that is manufactured by using the qualitative raw material. These raw materials are procured from trusted industries. These Non Silicone Mould Release Sprays are available in different specifications. We provide these Non-Silicone Mould Release Sprays as per the need of clients at competitive prices. Comprises Mould Release Silicone Spray & Mould Release Spray without Silicone. We are the leading manufacturer and trader of an eminent range of Non-Silicone Mould Release Spray that is available in several specifications. We do quality checking of these Non-Silicone Mould Release Spray before supplying towards client’s end. These Non Silicone Mould Release Sprays are used for the commercial and industrial purpose. Spray Fill India Private Limited provides a wide assortment of Silicone free Spray that is manufactured by using the qualitative raw material. These raw materials are procured from trusted industries. These Non Silicone Mould Release Sprays are available in different specifications. We provide these Silicone free Sprays as per the need of clients at competitive prices. Spray Fill India Private Limited is leading manufacturer of CO2 Spray. The distinct quality of CO2 Spray (Anti Spatter Spray) that we offer is manufactured and supplied in order to fulfill the need of various clients throughout the Indian subcontinents. CO2 Spray we offer, are available in various specifications. CO2 Sprays are having attractive attributes & long lasting shine with complete durability. Spray Fill India Private Limited is eminent manufacturer and supplier of a wide range Silicone Mould Release Spray that is highly demanded in every commercial and noncommercial sector. Our offered Silicone Mould Release Spray is manufactured using a high grade of raw material that is procured from our reliable and trusted vendors. Spray Fill India Private Limited is eminent manufacturer and supplier of a wide range Mould Release Spray that is highly demanded in every commercial and non-commercial sector. our offered Mould Release Spray is manufactured using a high grade of raw material that is procured from our reliable and trusted vendors. Spray Fill India Private Limited is leading manufacturer and supplier of Plastic Mould Release Spray. We offer Plastic Mould Release Spray to our client at very reasonable price. Spray Fill India Private Limited import Zinc Coating Spray from FAREN Chemical Industries, Italy. Spray Fill India Pvt. Ltd. is ISO 9001: 2008 Certified Company. We are one of the leading formulator and importer of Zinc Coating Spray that offers the convenience of on the job aerosol application and also protects hot-dip galvanizing. Quickly dries up to form a tough adherent protective coating of micro-fine Zinc particles. It is resistant to salt, water & has temperature resistance up to 700°C. Used in Transmission line construction for power plants in Thermal, Nuclear & Hydro Power plants, Wind Mill plants, poles and tower structures, fabricated structures, industrial pipelines, flanges, pipe joints G.I & M.S nuts and bolts. Used in Sub Station Equipments: Transmission Towers, welded structures, G.I & M.S nuts and bolts, G.I Hooks, Hangers, Cable Trays, G.I Railings, Platforms, G.I Gratings, Hand Rails, G.I Ladders. Used in Marine works and ship manufacturing parts and repairing. Spray Fill India Private Limited engaged in importing Zinc Spray from FAREN Chemical Industries, Italy. Spray Fill India Pvt. Ltd. is ISO 9001: 2008 Certified Company. We are one of the leading formulator and importer of Zinc Spray that offers the convenience of on the job aerosol application and also protects hot-dip galvanizing. 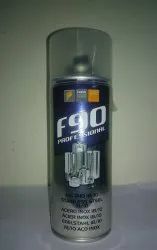 Spray Fill India Private Limited is engaged in manufacturing and supplying MS Galvanising Spray. Spray Fill India Pvt. Ltd. is ISO 9001 Certified Company. MS Galvanising Spray offered by us is manufactured with the high-quality raw material. We offered Zinc Metal Spray in different capacity packs. MS Galvanising Spray offered by us passes ASTM Standards evaluation after exposure. MS Galvanising Spray which we offer gives guarantees protection against corrosion and oxidation for a long period of time, even in open air. Its light-colored tint is very similar to that produced by hot-dip galvanization. Special packaging of these Sprays as to deliver safely at the client's end.